Analytical frameworks are a tool for unpacking and examining an art work using different viewpoints. The VCE Art Study Design describes four frameworks – Formal, Personal, Cultural and Contemporary. When we use the Formal framework, we analyse how the artist has used the elements and principles of art to convey meanings or messages. We examine the use of style, materials and techniques. Using the Personal framework, we explore the artist’s personal situation – how their history, beliefs and influences may be evident in the art work. We can also think about the ways that our own experiences affect how we view the art work. The Cultural framework is the one we use when we are examining the social, cultural and historical factors that surround the artist and that are evident in the art work. When we discuss how current ideas or ways of thinking influence our view of an art work (whether it is a more recent work or one from long in the past) we are using the Contemporary framework. Using the Contemporary framework we also explore how contemporary materials, media and ideas affect our understanding of a work. Following are examples of how the different frameworks can shape what is written about a particular art work. In Jacques-Louis David’s Napoleon Bonaparte, First Consul, crossing the Alps at Great St. Bernard Pass, 20 May 1800 of 1803, a uniformed Napoleon sits comfortably astride a wild-eyed, rearing horse on a snow-covered mountainside, his bright red cape whipped by the wind. One hand firmly grips the reins while the other points skyward over the peaks. Under the barrel of the horse’s chest the figures of soldiers can be seen pushing equipment upward through the bleak landscape. The strong use of diagonals gives the painting a sense of dynamism, the highest point of the red cape propelling the eye forward, mirroring the gesture of the mounted soldier and suggesting the direction and momentum of the attack. Wind rakes the horse’s mane and tail and sends the dark clouds sliding across the sky, suggesting the dynamic forces of nature harnessed by the invading army. Horse and rider are illuminated as if in divine affirmation of Napoleon’s power. Amid the wind and movement, Napoleon’s expression is steady, his eyes focused and intense. The painting’s red, white and blue – the colours of the Republic – lend boldness to the image and mirror the tricolour flag that waves in the corner of the composition, emphasising the force of the nation personified in the heroic figure. As a fervent supporter of the Revolution, David was captured by the charismatic power of Napoleon and the victories he brought the Republic. Although Napoleon’s proclamation of himself as Consul for life and then Emperor were in conflict with David’s Republican beliefs in democracy, liberty and equality, David believed in Napoleon as a saviour of France and benefited from many commissions to record the ceremonies and people of the new regime. David’s personal artistic style developed from years spent studying in Italy. His compositions were clear, Classical and somewhat austere. Among his early works were many which drew on allegories from Classical history to comment on events and ideas of his own time, but he was among the first to mythologise contemporary events. 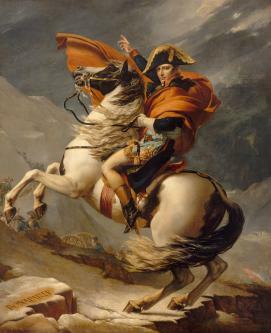 His depiction of Napoleon crossing the Alps drew on his knowledge of Classical equestrian sculpture. This painting records the crossing of the Alps by Napoleon’s army into Italy on a campaign that led to a series of military victories for Napoleon’s forces. The painting is an idealised one rather than a depiction of an actual scene. In reality, Napoleon would have worn a greatcoat rather than a cape, was not a confident rider and crossed the pass on a mule rather than a horse. The treacherous nature of the mountain terrain meant that all equipment and people were transported on foot or by mule, and horses were led. His troops were initially undisciplined, poorly equipped and dispirited, but were roused and rallied by the charismatic power of their leader and the victories they were able to achieve. Inscribed into the rocks on which the horse rears are the names Karolus Magnus and Hannibal. Bonaparte is newly inscribed alongside them. Karolus Magnus is the Latin for Charles the Great, also known as Charlemagne, King of the Franks and Emperor of the Romans, who created an empire that spanned Central and Western Europe. During his reign he conquered Italy and was named Holy Roman Emperor by Pope Leo III. Hannibal was a Carthaginian military commander who led his forces across the Alps to conquer Italy. Acutely aware of the power of the image, Napoleon commissioned David to paint him as a successor to the great empire-builders of history. It was one of many images that established the persona of Napoleon as a heroic and extraordinary leader of men. Though David’s depiction of Napoleon is clearly an image from the past, the painting unmistakably conveys the timeless notion of a man in control, with power over both himself and the natural world, the forces of destiny swirling around him. The use of aggrandising imagery to improve an audience’s perceptions of the subject is a tactic still much in use: Russian President Vladimir Putin has been known to pose for the media bare-chested astride a horse; deceased North Korean leader Kim Jong Il was said to promote his own legend with stories – that at his birth rainbows spontaneously appeared across the sky, that he never needed to defecate and that on his first attempt at golf, he achieved eleven holes in one. Today’s leaders frequently use the media of popular culture to manipulate opinion: Twitter and Facebook have joined television, radio and print media as ways to get messages across. Spin doctors are employed to skew the way that events are portrayed. Today’s political leaders also like to emphasise their connection to the ‘everyman’, removing the boundaries between themselves as the holders of power and the voters. Napoleon understood this too and commissioned images of his visits to the sick and dying. 1 Eleanor P. DeLorme, Josephine and the Arts of the Empire, J. Paul Getty Trust 2005, p. 35. 2 Richard Cantinelli, Jacques-Louis David : 1748-1825, Paris 1930, p. 70. How does the artist’s use of pictorial space contribute to the impact of the image? How does the artist balance the strong diagonals used? How could the scale of the painting (260 x 221 cm) affect the impact of the image? What personal associations does this image call to mind for you as a viewer? What emotions or ideas does it evoke? To what extent and in what ways are David’s personal history and beliefs reflected in the painting? How do you perceive Napoleon as a leader based on David’s painting of him? What qualities are required for strong leadership? Are the qualities required for leadership today the same as in the past? How are the leaders of our time represented? How does this compare to the way Napoleon has been depicted by David? Take a closer look at Louis Gauffier’s André-François Miot, envoy of the French Republic to the Grand Duke of Tuscany 1796 using Analytical frameworks.